A dance form developed in the early 20th century as a rebellion against the rigid constraints of traditional ballet including the technique itself, as well as the costumes and shoes. Quite literally, early feminists tore off their corsets and stiff shoes to allow for less constricted movement. Modern dance pioneers focused on creative self-expression and a more natural way to move. 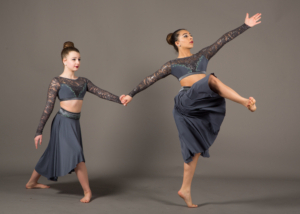 Modern dance is a more relaxed, free style of dance in which choreographers use emotions and moods to design their own steps, in contrast to ballet’s structured code of steps. It has a deliberate use of gravity, whereas ballet is rigid in its technique. Common characteristics of modern movements are contraction and release, rebound, suspension, spiraling of the torso, rise and fall and balancing off centre. Contemporary is today’s modern dance. It is a fusion of both traditional modern and jazz technique. The class structure consists of barre work and/or centre barre, seated exercises, traveling steps through space, change of direction. jumps, turns, and combinations.